﻿ Bathroom ideas for building with free repurposed and recycled materials. Bathroom decoration and design with repurposed materials. Repurposed construction materials and recycled items for bathroom design and decoration. Recycled barrels as washbasins, toilets, urinals in bars and pubs. Bathroom ideas for building with free repurposed and recycled materials. Free furniture plans » Inspiration for homemade furniture. » Upcycled materials for use in bathroom and toilets. Original ideas to use repurposed materials in bathroom and toilet. Suitcase repurposed as cabinet on the bathroom wall. One of the most neglected spaces for the use of repurposed materials is the bathroom. Nevertheless we have found many great ideas to improve this space with recycled materials and objects. One of these smart ways of repurposing is this medicine cabinet with mirror. As you can see it was very easy to make this cabinet. 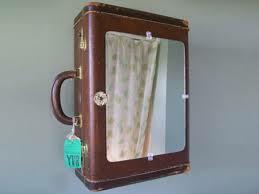 A suitcase bolted to the bathroom wall, with an old mirror stuck to the lid. Space saver under the bath. 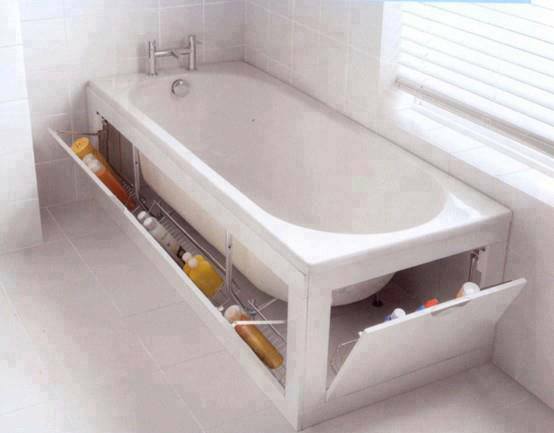 This is a very smart idea to create some extra space under your bath. Make extra storage space in your bathroom by using the empty room under the bath. Repurpose an old bath tub as table with chairs. You will need an angle grinder to cut the old bathtub into pieces. The frame for these chairs and the bench as well as for a table can all be made from scaffolding tubes. Table and chairs, made from a repurposed old shower plate and reclaimed bathtub. For the toilets in a bar and pub. Nice little fountains to wash your hands, made from buckets and barrels. Also great to use as a small sink, either inside or outside in the garden. You can make the wash basins below from an old beer barrel. 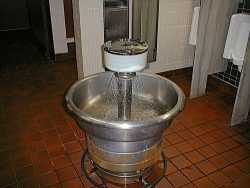 Cheap solution for making a wash basin. Buckets used as a washbasin. Extremely cheap and easy to make. If you need a small sink which is not connected to a main water outlet. Supported on a wooden stand which hides a reservoir for the dirty water. Use beer barrels to make bathroom furniture and utensils. Obviously great for use in the toilets of bars and pubs. 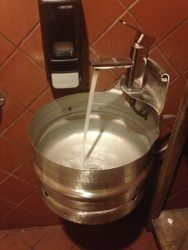 Nevertheless you can make these urinals and wash basins for your own home, provided you like beer. Futhermore, see extra ideas on our Dutch site about recycling and repurposed materials. Wash basin made from a beerkeg. 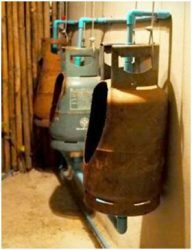 Urinals made from gas bottles. Nice design of a wash basin made from an old steel beerkeg. 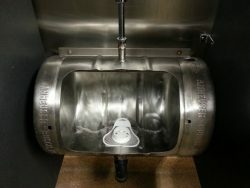 Bar and pub urinal made from recycled beerbarrel. And finally here’s one of the funniest ideas for the toilets in a jazz bar.